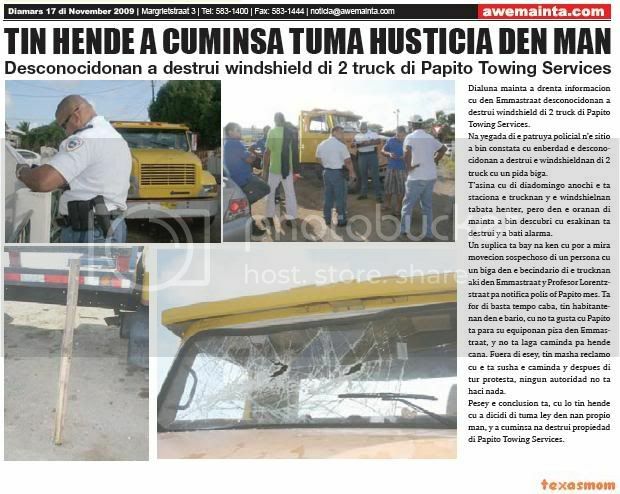 monday morning owing to enter informacion cu in emmastraat desconocidonan owing to destrui windshield of 2 truck of papito towing services. at arrival of the patrol policial n’e sitio owing to come constata cu enberdad the desconocidonan owing to destrui the windshieldnan of 2 truck cu one piece beam. t’asina cu of diadomingo night the is staciona the trucknan y the windshielnan was all, but in the oranan of morning owing to come descubri cu esakinan is destrui y owing to beat alarma. one suplica is bay at that cu can owing to see movecion sospechoso of one person cu one beam in the becindario of the trucknan here in emmastraat y professor lorentzstraat for notifica police or papito self. is for of enough time end, have habitantenan in the district, cu not likes cu papito is stop his equiponan pisa in emmastraat, y do not let caminda for person march. fuera of esey, have very reclamo cu the is soil the caminda y after of all protest, none autoridad do not haci nothing. pesey the conclusion is, cu will have person cu owing to dicidi of take ley in they own hand, y owing to cuminsa at destrui property of papito towing services. the sospechoso of traficacion of drugs for the netherlands, anderson rasmijn, is pasando momentonan dificil in kia, already cu the is wordo considera because; one redado. esey owing to trece cune past owing to wordo maltrata recientemente in kia. 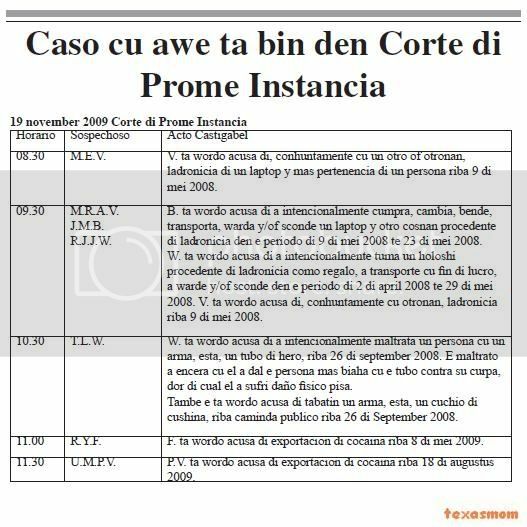 all this past owing to tell huez diabierna during tratamento of his caso. fiscal is acusa anderson rasmijn cu day 20 of july 2009 owing to exporta cocaine. anderson rasmijn day 20 of july 2009 owing to wordo deteni after cu the cacho across from drugs owing to reaciona on one person y after on maletanan of anderson rasmijn. both trunk had bom false. provided that overall 931,2 gram of cocaina owing to stay confisca. anderson rasmijn in interogacion owing to admiti cu had cocaina. past owing to believe cu is one trunk only had drugs, but after resulta cu is two trunk. the person after owing to wordo let pound already cu the not had bolita in curpa. rasmijn owing to tell cu the is sinti’e engaña already cu owing to word cu the is transporta 650 gram in one trunk y now is resulta cu is two trunk have cu drugs y mucho more cu owing to stay word. huez owing to read all the declaracion detail cu anderson rasmijn owing to give at police caminda past owing to menciona name of esnan cu is hinca in the operacion. have one such f. that t’e person clave cu is percura for hendenan transporta drugs for the netherlands. according anderson rasmijn, past owing to bay of acuerdo for transporta 650 gram of cocaina caminda the will achieve 5 thousand euro. past owing to tell huez cu past owing to angry very hour past owing to ripara cu they owing to us’e by of fill both trunk cu drugs enbez of one only as was planea. e such f. here is one person of corsow y according anderson rasmijn, the is one person dangerous. apparently orden will owing to wordo give in kia via via for beat anderson rasmijn. fiscal owing to is achieve legalmente prove cu anderson rasmijn conhuntamente cu others was in posecion of cocaina y owing to exporta this. fiscal owing to exigi 10 month of jail y for destrui the drugs confisca. huez owing to dicta sentencia of trip, caminda past owing to tell cu the is achieve anderson rasmijn culpable of posecion of cocaina y exporta. huez is achieve the castigo exigi for fiscal corecto y owing to condena anderson rasmijn at 10 month of jail y owing to give orden for destrui the drugs confisca. police is bay diadomingo 2’or of madruga, at one cas at gasparito for one attempt of kiebro. n’e cas police is talk cu the inhabitant, that is tell police cu the was sleep y owing to hear desorden in one bedroom of computer cu the have pafo of his cas. at once past owing to leave pafo y owing to come across cu two child young cu pins in they hand. past owing to bay for ask about they kico they're haciendo, but they all two owing to core bay y owing to enter forest. past owing to dicidi of bay controla rond of the cas y owing to come across cu one car toyota tercel berde a-15806 stop cu one person in dje. he sit in the car is bise cu his car have problem pesey the is stop eynan, but n’e same instant past owing to try of start the car p’e core bay. the inhabitant owing to bise stop y owing to succeed ranca the key of the car, after of one luchamento. he owing to bark the two hobennan y they owing to leave for of forest y owing to cuminsa send the inhabitant of the cas cu stone. at once he owing to bay inside, y owing to calling police. past owing to leave cu one tree of golf in his hand. the 3 hombernan cu owing to mire owing to core bay. more late he chofer is calling keep of police y ask about if the can come busca his car. police have the caso in investigacion. police is bay saturday 12.10 of night, at one cas at sabana broom, where will have one action feroz cu machete. police owing to bay at once n’e sitio, y eynan they're come across cu he y.a.r. of 34 year naci at venezuela that was march cu one machete in his hand y was sober y much aggressive. according informacion y.a.r. owing to bay for regulation cuenta cu the owner of the cas, because; cu the is tell cu the owner owing to menas’e y his casa. hour cu the owner of the cas owing to see is come in his direccion cu the machete, the inhabitant owing to core bay. y.a.r. owing to break the door of cas cu machete y owing to enter inside y owing to break one table diminutive of glass. hour cu police owing to detene, they owing to see cu past owing to injury his self y had one clip at his finger. police owing to hibe centro medico for tratamento y after owing to detene y hibe keep. the was enough bao of influencia of alcohol. owing to resulta cu the is ilegal also y not have permit for stay on the island. police owing to entregue n’e instancia concerni. tuesday first cu afternoon central of police is send one patrol at one cas at pos chiquito caminda will had one atraco y cu will had person injury. at arrival police owing to constata cu two child muher, y one boy, kendenan is conoci because; choler in the district, owing to maltrata one madam of 85 year cu intencion less good. of acuerdo cu informacion cu we owing to achieve is, cu the hobennan here owing to ask the madam big here water. hour cu past owing to become back, the personanan here owing to atak’e, owing to place serbete at cara of the madam y owing to try of stop the of breathe. hour cu they owing to believe of owing to succeed they aim, the atracadornan here owing to dicidi of look at kico have for steal. but thing they not owing to wait for is cu the madam balente here, owing to arise y cu all his edad here, past owing to know of fight cu they y cuminsa bark. so the malhechornan here owing to change of opinion y owing to core bay, but they owing to being reconoci. so cu police owing to arrive, owing to notifica is that the children muher y the boy was, y so the partuya policial owing to core in the district y at sabana broom owing to come across cu the malhechornan balente here. they owing to wordo deteni at once y now have to bay give cuenta of they actuacion. the madam big here, we conoce y although the have one edad high, the is conoci because; one person cu very forza. the is swim casi all day, teniendo his curpa in condicion. the have one granddaughter police y have some son, cu can fold iron cu hand. if they have to achieve the malhechornan here, assure they bingo will owing to play. The Aruban Minister of Justice and Education, Arthur Dower, is very concerned about the rising crime on the island. The situation among young people even call it alarming. He would therefore attract more police in the Kingdom. Dower has good news for Dutch tourists. Dutch tourists can now weather 180 days per calendar year stay in Aruba. This is the controversial measure of the previous government reversed, which led to the return of tourists. Dower, the admission decision has not changed, but its immigration service already instructed to act for the upcoming change. He may entail being longer than 180 days per twelve months on the island can continue. Dower is deeply concerned about the youth on the island. He calls the situation alarming. "What we see now is that many young people the wrong path, and involved in criminal activities. The disappointing performance in schools. We see many young people leave school without a diploma or without a box to have learned. "The current school structure allows young people with very low education is not always possible to learn a trade. Dower wants to explore opportunities to create this yet. Young people are also increasingly involved in serious criminal cases. Previously it was to vandalism and fights, but today is more about armed robberies. A number of factors play a role in Dower by this increase: there is too much tried to keep youngsters in school, social control is reduced because both parents often work, the community is more accepting that young people go off the rails and is less accepted that young people's behavior are addressed. Dower realizes that it is not the job of government is to educate young people, but the government does have the most trouble when it derailed youngsters. Therefore, the government part of the education mandated work. Dower: "The blurring of moral standards in our society, I think one step too far and that we should now try to reverse." Increasingly tourists are also attacked and robbed. Previously there was a great respect for tourists and fell. The risk is increased because many more economic activities in the vicinity of tourists are organized, making the contact between tourists and citizens has increased. The overall crime has increased. Dower is hard to bet against. That the police should also be expanded. He wants to do within the Kingdom to recruit. ORANGE CITY - Justice Minister Arthur Dower (ASF) calls the rise in crime and in particular among the youth "alarming". "It harms the charm of the island." Dower would like to create a function that is purely aimed at preventing juvenile delinquency. This, the Minister announced yesterday during a press conference. Dower also wants more police presence on the streets. This feeling of security to the people and tourists to increase. The problem is that there is "insufficient agents in our body are", so to give the Justice Minister. He wants to do both locally and within the Kingdom of recruiting agents. "The available manpower within the police force must also be better used to improve the results." The rising trend of criminality among young people reveals the minister very much. "Young people go the wrong path and performance in schools to be desired. Even the young people guilty of crimes which make increasingly serious. "In the past, says Dower, youth were primarily involved in vandalism and fights. "Now that we are becoming increasingly involved in armed robberies and serious assaults. This causes damage to the charm of our island. "The minister would also provide more police and security around schools and areas where young people gather. Together with his fellow ministers Dower would come with a package of measures. This he hopes "short term" successful results. asistencia of police owing to wordo ask diadomingo 6’or of morning n’e rotonde of seroe blanco, where one car owing to lever on the rotonde. 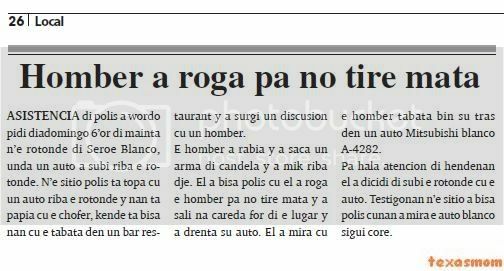 n’e sitio police is come across cu one car on the rotonde y they're talk cu the chofer, that is tell they cu the was in one bar restaurant y owing to surgi one discusion cu one man. he owing to angry y owing to saca one arm of candela y owing to aim at on dje. past owing to tell police cu past owing to beseech he for not tire kill y owing to leave at careda for of the lugar y owing to enter his car. past owing to see cu he was come his slow in one car mitsubishi blanco a-4282. for wing atencion of hendenan past owing to dicidi of lever the rotonde cu the car. testigonan n’e sitio owing to tell police cunan owing to see the car blanco follow core. diadomingo 12.15 of afternoon, one mother is calling keep of san nicolas, y is tell polisnan cu his son cu was perdi owing to go back cas. the is tell cu the child is bao of influencia tanto of alcohol y of drugs y is deal very aggressive. police owing to bay n’e cas y owing to constata locual cu the mother owing to tell. they owing to try talk cu the boy, but without result. they owing to detene y owing to hibe keep y owing to place j.k.z.p. at height. asistencia of police of north owing to wordo ask monday 01.15 of madruga at one snack at kudawecha, for one action. n’e sitio, police is achieve informacion cu two brother m.t. of 23 y r.t. of 26 year, owing to maltrata they father y also they brother muher. 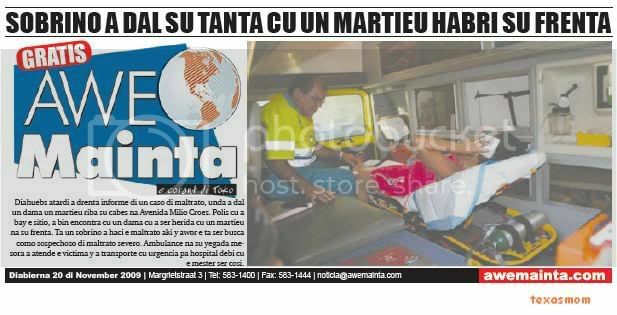 ambulance owing to come n’e sitio y owing to give tanto the father because; the brother muher tratamento n’e sitio. police owing to detene the two rumannan. police owing to tell the father cu the can bay give complaint of maltrato at recherche. one muher, that owing to become victima of maltrato at hand of one chinese, monday 5’or of nightfall is ask asistencia of police. 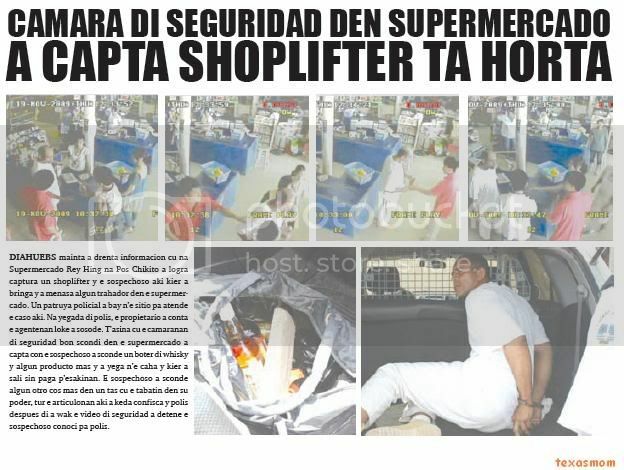 police owing to bay n’e supermercado in caya betico croes, y eynan police is talk cu the muher y.o.v. naci at colombia of 42 year, that is tell police cu his colega chinese j.z. naci at china of 25 year, owing to dal’e one pair of trip cu fist in his pecho..
the motibo is cu past owing to ask the chinese for presta his stair. y.o.v. owing to coy the stair y the chinese owing to angry y owing to bay on dje y owing to dal’e various trip cu fist in his pecho. y.o.v. owing to tell police cu the supervisor owing to regulation the problem, but the wanted owing to tell police locual cu owing to happen, because; cu do not first trip. asistencia of police owing to wordo ask monday 7.30 of night, at one cas at nuñe, where one madam owing to arrive his cas y owing to see 4 boy leave at careda for of one cas. police owing to bay n’e sitio, y owing to see cu the ladronnan had enough cos cla poni for bay cune end in the balcon of the cas. also they owing to desmantela one airco completo. police owing to notice cu the cas not have conexion neither of water neither of coriente. fast the cas had one jeep blau, in cual the hobennan owing to core enter y owing to bay for of the cas. also police owing to achieve one cantidad of herment cu they owing to let behind. all cos owing to wordo take in beslag. one mother owing to calling keep of police monday 3.45 of nightfall, y is tell police cu past owing to descrubri one kill of marihuana. police owing to bay n’e cas at macuarima, y eynan is talk cu the mother, that is tell police cu his child of 18 year, have his life amarga. 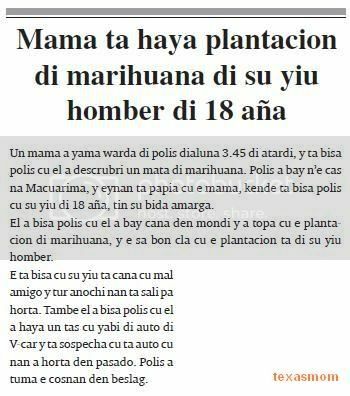 past owing to tell police cu past owing to bay march in forest y owing to come across cu the plantacion of marihuana, y the know good cla cu the plantacion is of his son. the is tell cu his child is march cu bad amigo y all night they're leave for steal. also past owing to tell police cu past owing to achieve one bag cu key of car of v-car y is sospecha cu is car cu they owing to steal in pasado. police did take the cosnan in beslag. yesterday morning, owing to base of one investigacion cu owing to cuminsa at may 2009, miembronan of landsrecherche owing to detene the ex director of vrom, ex acolyte of faction wave y acolyte actual of the faction politico msi, ir. 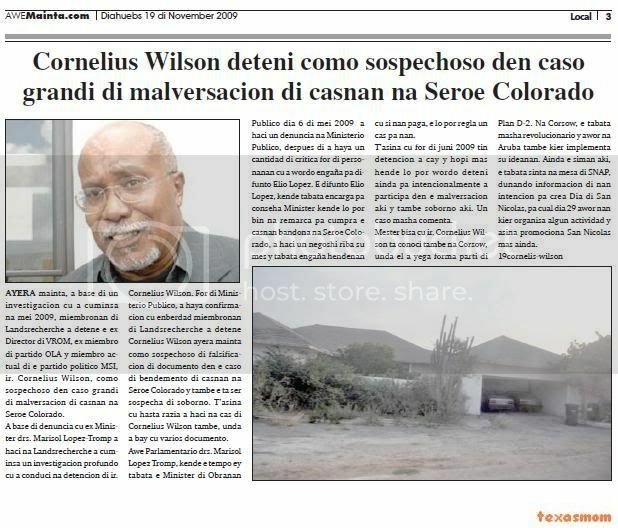 cornelius wilson, because; sospechoso in caso big of malversacion of casnan at seroe colorado. owing to base of denuncia cu ex minister drs. marisol lopez-tromp owing to haci at landsrecherche owing to cuminsa one investigacion deep cu owing to conduci at detencion of ir. cornelius wilson. 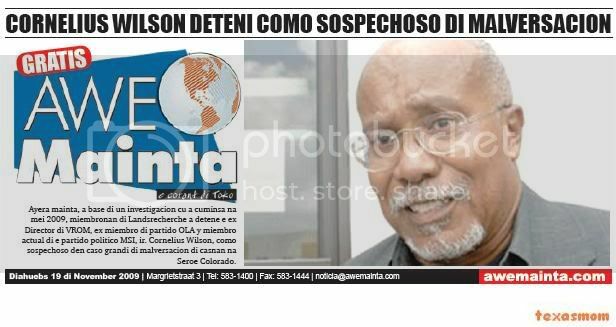 for of ministerio publico, owing to achieve confirmacion cu enberdad miembronan of landsrecherche owing to detene cornelius wilson yesterday morning because; sospechoso of falsificacion of documento in the caso of bendemento of casnan at seroe colorado y also the is being sospecha of soborno. t’asina cu even razia owing to haci at home of cornelius wilson also, where owing to bay cu several documento. today member of parliament drs. marisol lopez tromp, that the time ey was the minister of work publico day 6 of half 2009 owing to haci one denuncia at ministerio publico, after of owing to achieve one cantidad of critica for of personanan cu owing to wordo engaña for difunto elio lopez. the difunto elio lopez, that was encarga for conseha minister that will can come at remarca for cumpra the casnan bandona at seroe colorado, owing to haci one business on his self y was engaña hendenan cu if they pay, the will can regulation one cas for they. t’asina cu for of june 2009 have detencion owing to cay y much more person will can wordo deteni still for intencionalmente owing to participa in the malversacion here y also soborno here. one caso very comenta. have to tell cu ir. cornelius wilson is conoci also at corsow, where past owing to arrive form part of plan d-2. at corsow, the was very revolucionario y now at aruba also wanted implementa his ideanan. still the week here, the was sit at table of snap, dunando informacion of they intencion for crea day of san nicolas, for cual day 29 now they wanted organisa some actividad y so promociona san nicolas more still. tuesday afternoon 12’or, police of san nicolas is achieve one call, cu is tell cu one madam big wordo atraca in his cas. 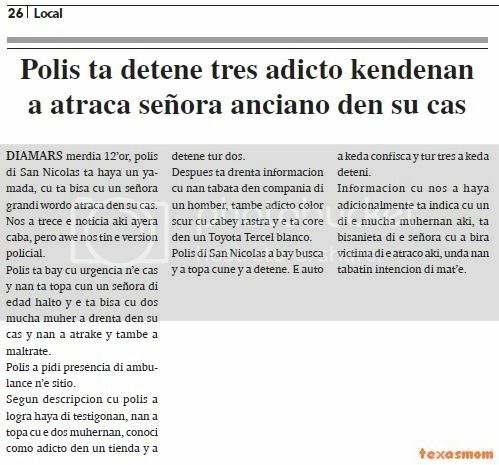 we owing to trece the news here yesterday end, but today we have the version policial. police is bay cu urgencia n’e cas y they're come across cun one madam of edad high y the is tell cu two child muher owing to enter in his cas y they owing to atrake y also owing to maltrate. 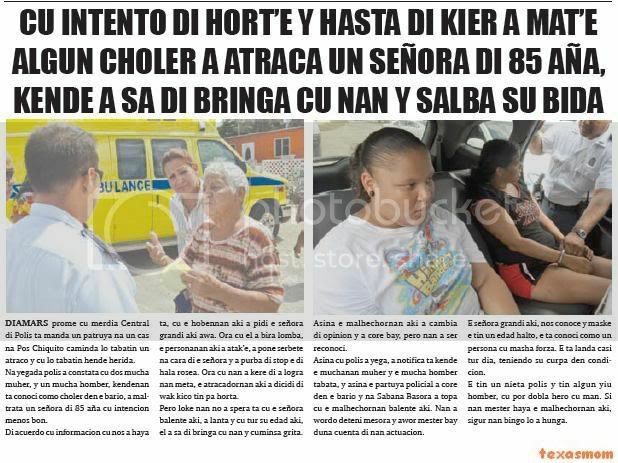 police owing to ask presencia of ambulance n’e sitio. according descripcion cu police owing to succeed achieve of testigonan, they owing to come across cu the two muhernan, conoci because; adicto in one store y owing to detene all two. after is enter informacion cu they was in compania of one man, also adicto color dark cu cabey rastra y the is core in one toyota tercel blanco. police of san nicolas owing to bay busca y owing to come across cune y owing to detene. the car owing to stay confisca y all three owing to stay deteni. informacion cu we owing to achieve adicionalmente is indica cu one of the child muhernan here, is granddaughter of the madam cu owing to become victima of the atraco here, where they had intencion of mat’e. tuesday nightfall 2.30, police of san nicolas is bay at one botica in caya big at san nicolas, for one caso of ladronisia. hour cu police owing to arrive they're talk cu the owner, that owing to tell cu past owing to grab the muher owing to.n.w. naci at aruba of 55 year, is steal one boter of nyquel y owing to hinke in his bag. the owner is tell police cu the bag cu owing to.n.w. owing to come cune, also is one bag cu past owing to arrive of steal in the botica, in cual the time ey had one suma of coin. police owing to detene a.n.w. y owing to hibe keep for more investigacion. presencia of police owing to wordo ask tuesday 2.15 of nightfall, at seroe of hooiberg, where one tourist wanted dune complaint of ladronisia of his car. the tourist g.h. of 56 year, naci at estados unidos is tell police cu they was on seroe of hooiberg y for of one distancia they're see one van cora stop y two boy owing to descend for of the car y owing to break they v-1571 y owing to bay cu one bag for of the car. the is tell cu in the bag had one carson y one t-shirt. 08.30 m.e.v. v. is wordo acusa of, conhuntamente cu one another or others, ladronicia of one laptop y more pertenencia of one person on 9 of may 2008. 09.30 m.r.a.v. j.m.b. r.j.j.w. b. is wordo acusa of owing to intencionalmente cumpra, change, sell, transporta, keep y/of sconde one laptop y another cosnan procedente of ladronicia in the period of 9 of may 2008 till 23 of may 2008. w. is wordo acusa of owing to intencionalmente take one holoshi procedente of ladronicia because; present, owing to transporte cu end of lucro, owing to warde y/of sconde in the period of 2 of april 2008 till 29 of may 2008. v. is wordo acusa of, conhuntamente cu others, ladronicia on 9 of may 2008. 10.30 t.l.w. w. is wordo acusa of owing to intencionalmente maltrata one person cu one arm, esta, one tubo of iron, on 26 of september 2008. the maltrato owing to encera cu past owing to strike the person more trip cu the tubo contra his curpa, by of cual past owing to abide damage fisico pisa. also the is wordo acusa of had one arm, esta, one cuchio of cushina, on caminda publico on 26 of september 2008. 11.00 r.y.f. f. is wordo acusa of exportacion of cocaina on 8 of may 2009. 11.30 u.m.p.v. p.v. is wordo acusa of exportacion of cocaina on 18 of august 2009.
diahuebs nightfall owing to enter informe of one caso of maltrato, where owing to strike one lady one martieu on his cabes at avenida milio croes. police cu owing to bay the sitio, owing to come encontra cu one lady cu owing to being injury cu one martieu at his forehead. is one sobrino owing to haci the maltrato here y now the is being busca because; sospechoso of maltrato severo. ambulance at his arrival at once owing to atende the victima y owing to transporte cu urgencia for hospital debi cu the have to being cosi. diahuebs morning owing to enter informacion cu at supermercado rey hing at pos diminutive owing to succeed captura one shoplifter y the sospechoso here wanted owing to fight y owing to menasa some trahador in the supermercado. one patrol policial owing to bay n’e sitio for atende the caso here. at arrival of police, the propietario owing to count ; the agentenan thing owing to sosode. t’asina cu the camaranan of seguridad good scondi in the supermercado owing to capta con the sospechoso owing to sconde one boter of whisky y some producto more y owing to arrive n’e box y wanted owing to leave without pay p’esakinan. the sospechoso owing to sconde some another cos more in one bag cu the had in his power, all the articulonan here owing to stay confisca y police after of owing to look at the video of seguridad owing to detene the sospechoso conoci for police. the sospechosonan chris williams y derrick dania owing to listen procurador general interino exigi 4 year y 7 year of jail for they. chris williams, derrick dania y luis paredes berio owing to apela they sentencia in the caso of tiramento of gang of dakota. luis paredes berio, that is sintando one castigo of 4 year of jail, owing to dicidi of wing his caso inside. had enough dificultad for cu tratamento of the caso, already cu in first instant not can owing to achieve one traductor. after one griffier owing to come traduci for derrick dania, while cu chris williams self owing to expresa his self at dutch. derrick dania owing to tell cu past owing to apela his castigo of 5 year y mey, because the is wordo castiga p’e tiramento at havana, siendo cu the not owing to throw. past owing to admiti of owing to throw near of juliana school. chris williams owing to expresa cu the is wordo condena for algo cu the not owing to haci. past owing to desmenti categoricamente of owing to throw at eagle beach. corte in first instancia owing to conden’e at 3 year y mey of jail. procurador general interino, mr. stein owing to achieve cu chris williams because; derrick dania culpable y owing to exigi for aumenta the castigo for they. past owing to exigi 7 year of jail for derrick dania y 4 year for chris williams. the tratamento owing to last till in oranan of nightfall, caminda abogadonan mr. edwin duijneveld y mr. peter mohamed owing to defende chris williams while cu mr. lotter homan owing to defende derrick dania. hof owing to ked owing to of evalua the caso y day 7 of december will dicta sentencia. ORANGE CITY - Alfred Christopher Williams and Derrick Dania, members of the state of Dakota, this week appealed to 4 and 7 years imprisonment to her demands heard. It was two by the Court of First Instance sentenced to 3.5 and 5.5 years imprisonment, including for attempted murder and participation in a criminal organization. The original requirement of the Public Prosecutor (OM) was 5 years to 8 years for Williams and Dania. The offenses took place in the month of July 2008. At the beginning of that month there was a shooting at Eagle Beach, where shots were fired towards a car. Later that month there were eight shootings turn to beach and Havana on the square at the Juliana School. These incidents were related to gang activity, according to Justice. The way of targeting the Dakota would have on members of the gang Madiki. In First Instance was right with the gang once and referred to the Dakota as "criminal organization". Chris Derrick Williams and Dania were after the verdict of the Court appealed. The former soldier Luis Paredes Berio was in the same case sentenced to 4 years in prison for involvement in three shootings. The prosecution had demanded him 5 years. Berio also appealed but later withdrew his appeal again. Dania an appeal because he says he is sentenced for a crime he did not commit. He admitted having shot near the Juliana School, but denied the shooter to shoot at a beach in Havana. Chris Williams also claims to be sentenced for crimes not committed. He would stress to have shot at Eagle Beach. In the same case were the Court on May 15 this year Hermain Cabrera and Nigel Williams respectively sentenced to 1.5 years and 13 months imprisonment. Expected, the Court ruling on December 7. Page created in 8.641 seconds with 19 queries.